BONUS: Earn points throughout the class to redeem for free prizes at the end! At Evidence Based Birth®, we believe that every person has their own unique path. Instead of focusing on medicated vs. unmedicated birth, we focus on giving you tools and helping you learn the evidence, so that you can be empowered to make your own decisions! We do have a strong emphasis on non-drug comfort measures, because they have no side effects and can be used by everyone, whether or not you plan to use medications. At the end of this class, you will have all the tools you need to create your ultimate labor and birth experience. If you want a natural birth, this class will give you the relaxation and pain management tools you need to have a natural birth. If you need or want an epidural or Cesarean, we’ll cover how you can be empowered that way, too! WHAT KIND OF COMFORT MEASURES WILL I LEARN? We focus on comfort measures such as movement, positioning, water immersion, as well as deep breathing, visualization, and relaxation. Each student will be given tools to practice their relaxation exercises at home. IS THIS CLASS APPROPRIATE FOR HOME BIRTH OR HOSPITAL BIRTH? We’ve had students from all different birth settings take our class! Our focus on non-drug comfort measures makes it applicable to home birth as well as hospital birth clients. Home birth clients will have a special video to watch about home birth and home-to-hospital transfers. HOW MUCH DO THESE CLASSES COST, AND WHERE / WHEN ARE THEY OFFERED? Deluxe package: Includes 6-months access to the online portion of the class, printed materials, private Facebook community, two in-person classes, a class reunion. a private birth planning session or fear release session with me, and your choice of a professional grade birth ball, peanut ball, or rebozo. Q: Can’t I just educate myself online using Google and YouTube? A: We are so fortunate that today there is a wealth of information available online. The only problem is… a lot of that info you find from Google and YouTube? It’s bad or inaccurate! 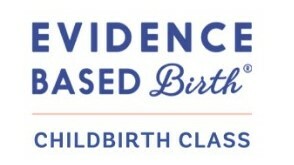 The benefit of the Evidence Based Birth® class is that we curate all of the best, evidence-based information for you into a fun class, that gets you and your partner engaged in the learning process. What’s more, you can ask your Instructor questions any time about the information that you’re consuming! This means that you get to educate yourself with quality information, while having the benefit of an experienced Instructor mentor you through the process! Q: Can’t I just let the doctors and nurses tell me what to do? A: Here’s the problem—routine practices in some hospitals are still about 15 to 20 years behind the research. It’s critical that you become your own advocate. Your health care system is probably not some shining beacon of best practices—that’s because mistakes happen, and hospitals are institutions. Inside of institutions, there is a lot of pressure to conform to traditions and routines that might not be in your best interests. It’s time for you and your partner to learn how to speak up and use your voice. To ask questions. To make informed decisions. We will teach you how to be your own advocate in this childbirth class—and this is a skill you can use for the rest of your life, no matter what health issues you face in the future! Q: My friends had a baby last year, and they told me that taking a childbirth class is a waste of time. A: We have a problem in our culture, and that is that there are a lot of poor quality childbirth classes out there. This has given childbirth education a bad rap. In developing this particular class, Rebecca Dekker, PhD, RN, the founder of Evidence Based Birth®, actually reached out to millennials and Gen Z and asked—what do YOU want in a class? And then made it just like they asked! Another perk is that Rebecca used to be a popular college professor, and so she knows how to make classes engaging for young adults. The end result is a class that is fun, motivating, and exciting to participate in. A: Many of our students are incredibly excited to learn about the entire toolkit of comfort measures, or pain management strategies, that we teach for labor. You will get two weeks of online videos with demonstrations on how to use highly effective pain management strategies that are useful for both medicated and unmedicated birth. We cover everything from how your partner can massage you, to water immersion, using a birth ball, upright birthing positions, acupressure, music therapy, and abdominal breathing, just to name a few. Each week you will earn points for practicing these strategies at home. Then we’ll meet in person at the end for a Comfort Measures Rehearsal. When labor starts, you and your partner will be ready! If you have questions about taking a class, I encourage you to reach out to me - you can email me at birth@lisahiguchi.com, or call/text me at 951.757.8154. Please put “Childbirth Class” in the subject line if you email me, so I can be sure to get back to you right away! Choose your class from the list below and click on the link. Once you get to the class page, you will select the standard package or deluxe package, then click “Add to Cart.” You will then see the little shopping cart symbol at the top of the page. Click on it, and it will guide you through the checkout process. You will be given the option to pay with a credit/debit card or PayPal. I also accept Venmo. if you’d like to pay that way, email me with the class / package you want and your Venmo ID, and I’ll send over a payment request in the Venmo app. Once you have completed the registration process, including payment, I’ll send you the info to access to the online orientation videos within 24 hours (usually within a couple hours) including detailed information about the first in-person class session.